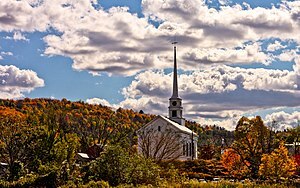 According to PWC’s recent quarterly MoneyTree report, no new medical device companies achieved Series A fundings in New England in either Q2 or Q3 2013. Zilch, zip, zero, nothin’, no, nada. I’ve been tracking first-time venture financing of medical device companies in Nw England since 2005. You’ll find the link to my latest list of these companies at the bottom of this post. I wish I had a better update to offer. What’s causing this New England drought? It’s been about a year since I published a list of newly venture-funded New England medical device companies, so it’s time for an update (see below). The Series A rate continues to trend at two-per-quarter, despite the purported decrease in the number of active VC’s. Last year I noted the surprising proportion of diagnostic technologies in the startup list. Over the last four quarters, only one of eight newly-funded startups is developing a diagnostic. That’s more in line with expectations. This year I’m taking the opportunity to respond to a question from a colleague: Should I syndicate my Series A round or raise funds from a single venture investor? Developing new products to improve patient care is the best part of being in the medical device industry. Who can argue with that? You’ll find the most exciting devices being developed in venture-funded start-ups – a structure that provides the single-minded, do-or-die focus needed for success, along with the risk capital needed to fuel the work. Here in New England, we have a great medical device start-up ecosystem, with dozens of companies working to solve significant medical problems with great new devices. Each quarter, the MoneyTree Survey lists virtually all venture financings in the US. The 2011 Q1 numbers just came out. 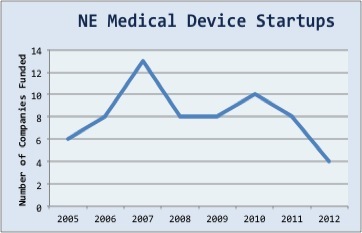 Reviewing the data, I thought it would be a good time to look back at the New England medical device companies started in the past several years.